A few days ago as I was pulling into the driveway at home I couldn’t help but notice some of the spectacular fall colors. Sure we’ve all seen the wonderful displays of color on the hillsides as we travel, but today I want to share with you a few plants that I think are noteworthy if you’d like to add some fall color to your landscape. And they are all just as nice during the growing season, just different colors. Let’s start with Heuchera (Coral Bells), Caramelle. Heuchera, common name Coral Bells are great plants for the landscape because they are perennial which means the come back every year, but they need very little maintenance. I don’t even cut mine back in the fall, I’ve found that just by leaving them as is they look good all winter, then come spring the new growth emerges and completely engulfs the old growth and the plants look fantastic. The fall color of ‘Caramel’ Coral Bells is really special. The good news is that the color is nice year found. Spring and summer the color is more orange and less purple. Next up we have Goshiski Shidare Japanese maple. This is in the family of Laceleaf Weeping Japanese maples but this one has variegated leafs that look pink in the early spring. The fall color is very striking. Even with all of this fall color you can still see the variegation in this beautiful tree. The similar brilliant orange tree in the background is a ‘Waterfall Japanese maple. Check it out below. Waterfall Japanese maple, fall color. Is that not a spectacular fall color? During the growing season this tree is light green. Let me see if I can find a photo. Here we go. In less than two weeks along came the snow and transformed my beautiful orange tree into this. Lion’s Head Japanese maple is a very interesting tree during the growing season because it’s leaves are dark green, quite small and slightly curled. In the fall they turn to a burnt orange then almost red. This tree has been in our landscape for eight years and still it’s only about 30″ tall and 30″ wide. Truly one of my favorite plants. Tough as nails come winter! Sango Kaku ‘Coral Bark’ Japanese maple. Also called ‘Coral Bark’ Japanese maple because of its striking coral or red colored branches that really stand out in a snow covered landscape. We can’t have a conversation about plants with spectacular fall color without mentioning and showing off a few Burning Bush. Some folks will tell you that Burning Bush is an invasive species and most of the time they are wrong. There are two kinds of Burning Bush. Eunoymus Alatus Compacta which I’ve shown here, also known as Dwarf Burning Bush, even though they can get quite high. Then there is the old standard Burning Bush, Euonymus Alatus, which has a much more pronounced wing on the bark which actually makes it quite interesting during the winter when the leaves are off. However, this “old fashioned” Burning Bush is on the invasive species list in some states. Some people tell me that the compact variety is as well. I don’t know nor do I understand why. Guess where I’ve been for the past forty years? On my hands and knees crawling around in the dirt. I’ve mulched under and around thousands of Burning Bush and in all that time I’ve found maybe three that came up as chance seedlings. I wish I could say that for maple trees. My neighbor at the old house, he had a hedge of “old fashioned” Burning Bush around his entire backyard. Was his yard over grown with Burning Bush seedlings? Not at all. I never saw any and he never ever mentioned to me that they were a problem. So in some places they might be, but here in northern Ohio I just don’t believe it. I had somebody tell me one time that up in New England at one of the colleges Euonymus Alatus completely took over one of the flower gardens. My first thought?, Was anybody in charge of weeding the flower gardens? Burning bush is a pretty slow grower, it’s not going to take over anything very fast. So obviously I am not buying into that theory. Next we have Green Cascade Japanese maple. Green Cascade is beautiful in the fall and an interesting lighter shade of green during the growing season. Leaf color is a lot like ‘Waterfall’, but the leaf texture is different and the branching habit is very much different. An interesting plant because you won’t see many of them around. That my friend is spectacular! Before you leave, stop by and say “Hi” to Pam and the donkeys, we took some photos for you. I live in a warm client (North Carolina). I like the looks of the weeping Japanese maple. Would you recommend it for zone 7? Absolutely! Zone 7 is the perfect climate for Japanese maples of all kinds. If possible plant the tree in an area that gets some shade during the hottest part of the day. The delicate leaves of the Lacedleaf maples can burn around the edges if in full sun. Filtered shade is perfect. With that said, I grow mine in full sun but it is hard on them. A little shade would be better. Mike, I dearly love to see your smiling face on your comments and information. My Japanese Maple succummed to our deadly cold lasts winter. It branchhed quite low on th je trunk. I saved one branch—do I have a root stock tree coming? It’s difficult to say. The branch that you have might be from above the graft union, and if that’s the case it will be identical to your original tree. But if it’s from below the graft union it will like be just a green leafed root stock. However, some root stock are interesting. I have an althea (rose of sharon) that has a gorgeous white blossom with a deep rose center. I reseeds invasively but is so pretty I give away as many as I can. In the wet of spring they pull easily and seem to survive well when transplanted. I advise friend to put them where it will be closely mowed near them. Is there any way to prevent their germination? or any market for the seedling? I enjoy your garden emails immensely! You should be able to control seed germination by applying a pre emergent herbicide around the plants. Pre emergents control weed seed germination. A market for them. I suppose there is but I would discourage selling this particular plant because I rather see you get a couple of named varieties of rose of sharon that do not reseed. Propagate those and sell them tagged with their proper botanical and common name. That truly is best way to get started on the right foot. The market for something like that would be huge. They are easy to grow from hardwood cuttings. https://mikesbackyardnursery.com/2015/01/easy-winter-time-plant-propagation-can-home/ In my nursery I grow Blushing Bride, Ruby and Aphrodite. I bought my original plants from one of my customers in Arkansas and I’ve been propagating from them ever since. Can scarring around the base of a Japanese Maple eventually cause it to die? Our yard guy (I call him a Bull-in-a China-Shop gardner) who mows and trims during the spring and summer on the Gulf Coast is not very precise when working, and the trees show it. At the time of its demise the maple was 3-4 years old. After that lose all new plantings (a Cyprus, River Birch, Red Bud) have a ring of bricks around them. Absolutely, if the bark and cambium tissue are removed all the way around the base of a tree it will die. The cambium layer is actually pretty thin below the bark. Tree guards might be needed. I am looking for a bush or maybe a small plant called Honeysuckle bush. It has a tiny flower and bloomes in the summer The fragrance is wonderful. Can you help me find one??? I can’t. I’m sure we have members that grow them but I wouldn’t know at this time. I’m sure you can order one online. It grows extremely fast in the Seattle area. Yes, the fragrance is wonderful. Blooms are either pink or yellow. Everyone around here start from cuttings from friends. I have a bunch for you. They are easy to proprogate using Mike’s technique. I’m just starting my nursery. Mike, love the pictures! You keep inspiring me! Thanks Wendi, I appreciate that. The Maples on this page are beautiful. I would like more information on growing house plants like ivy and philodendrons. Just clarifying my typos 🙂 When watering, the soil should be fully saturated and then not watered again until the top couple of inches or so of soil feels dry to the touch. You are up north. I am in Austin Tx. Very hot, long summers and usually not much freezing, but often hard freeze for very short time in winter. How would your information on “back yard gardening to sell plants” and general info help me in the hot South? Is it really feasible to do down here what you do up there in selling plants? 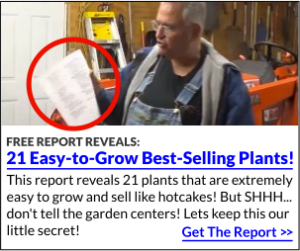 (I understand I can check locally as to what grows well here and what doesn’t, but would I get enough usable info from your newsletter and buying the “How to do it” plan for $49? I have a number of members in Texas that do very well growing and selling small plants. Because you don’t fight the cold like we do in many ways you have an advantage. We have members all over the world in every climate imaginable. The information is universal, plant selection does vary by region. Thanks Bob. You can’t really rush a Japanese maple just enjoy them along their slow, lazy path to beauty. I too really like the donkeys. Thanks for all the color on this pretty cloudy day in NE Ohio Mike. I continue to appreciate all your videos and look forward to getting involved in your backyard business group in the next year. I’m glad to hear it! I’m not going anywhere. We’ve busy at the nursery this week digging Japanese maples and transplanting some Lavender Twist Redbud trees. Trying to make a little more room for the donkeys. Mike, I’d like to do your system in Germany. But I do not have a CreditCard yet. So how can I purchase all your fantastic stuff, for example with paypal? And is your system suitable with Germany, with our sellers and buyers rules? E.G. in Bavaria you have to be a professional Gardener to sell plants as business. Mike ,here in SE Texas with out heat the japanese maples have a hard time. You’re right, Japanese maples do okay in the heat, it’s the intense sun that really gets to them. I have a member that grows a lot of them in Alabama but all of hers are protected by shade trees. I Have a Burning Bush in my backyard that I treasure. Living here in Marblehead, Massachusetts I was surprised to learn a few years ago they are banned in this state. (wouldn’t you just know Ma. would go along with this). If I ever had the chance to bring one in tho, I would do it because the one I have is NOT invasive and adds so much color to the Fall landscape. I would love to have the Waterfall Japanese Maple. It is so beautiful,. The reason burning bush has taken such a bad wrap is how easily they bird scatter. After the leaves drop and all that’s left are the nice red fruit, the birds devour them and then drop them later, far from the plant. That’s why you won’t see the effects near the plant like a tree that scatters by wind. It got banned because there are burning bushes growing all over the forest near you most likely. Really bad here with honeysuckle. I see a burning bush in the middle of nowhere every once in a while. And when conservationalist see things in their nature that they know doesn’t belong there, they get upset. Between the compact version and “regular” I would see no difference in the spreading. I have a dwarf potted up in my backyard. It’s very full with fruit which I’m sure will disappear shortly. Thanks for sharing about the bird scatter but I’m still having a difficult time with it. In this county we have over 100 wholesale nurseries reporting well over 85 million sales. Almost all of them grow and sell burning bush by the thousands or tens of thousands. At one time some growers had 100,000 or more in the field. Still, living in this area my entire life, having spent most of that time on my hands and knees in the dirt, I’ve yet to find more than three Burning Bush growing from chance seedlings. This year Burning Bush in this area was really, really, really in short supply. Nobody on the wholesale market had any 18″ Burning Bush to sell. And that’s what bothers me by all this. If you want a burning bush around here you have to intentionally grow them. Yeah, yeah I know. I’m a “Dumb Ole Dirt Farmer” and I just don’t understand. I get that, and maybe that’s it. Maybe I just don’t understand. We have a similar situation in California with pyracanthus. The robins come thru in the late Fall and get drunk on the fermented berries, then poop the seeds everywhere. Here in California we have very little native fall color – some nice stands of aspen up in the Sierras – So we plant a lot of Liquidamber and Chinese Pistache. I have seen Japanese Maples in a brilliant clear scarlet. So striking among all the dull greens! How do you propagate coral bells? The easiest way to propagate coral bells is to divide them but you can also cut a slip from the side of the plant and have it rooted in a few weeks. That’s more of a summer technique. Many coral bells are patented so make sure you know what variety you have. Wow! Stunning! I am now hooked on Japanese Maples! Love your articles.. so informative! I want to sign up and will in the spring I hope.Thanks! Beautiful Japanese maples! But I’d like to more of them pruned to show off their characteristic graceful “uneven” natural shape, instead of the dense mushroom shape. I agree, they can be grown out more to be more natural. It really depends on where the plant is and what your personal taste is. I have a recommendation for a beautiful yet underutilized small tree. Look up serviceberry. It’s a beautiful little tree and not near as expensive as Japaness Maple. You’re right, Service Berry, also known as Amelancher is a great plant and it is underutilized. I know that maples seed more easily than almost any tree, and I am wondering what your experience has been with The various varieties of Japanese seedlings? Are they complete mutts, or do are there species that are dominant no matter what. I take seeds off all sorts of plants just to see what will come up, and what won’t and how closely the children will be to the parents. Your thoughts are appreciated. Great question. Most aren’t really that close to the parent plant unless you stay with the basic varieties. If you collect seeds from a regular upright Japanese maple that has good red color you will get many seedlings with good red color. Other varieties? Not so much. Most of them came from complete flukes that were identified as being unique and interesting and they have been grown since all via asexual reproduction, not seed. Even the mutts are beautiful! Pot them up and offer them to friends who like to practice grafting techniques. Your Japanese maples are just spectacular in the fall. Are there any that do not exceed 6 ft. or so? Many Japanese maples can be kept under six feet. I don’t have any in my landscape that are over six feet and I probably have a dozen in my landscape. The weeping varieties never get that high. I am stratifying some Japanese Maple seeds for planting this spring. I know they will not grow true to their parent, but I should get something with great fall color. Is it worth the effort? If I have extra plants can they be sold as seedlings of their named parent plant? It’s best that they be sold as just Japanese maple seedlings. If they have good red color that is a plus and the demand is there. If they are just green they can be used as grafting stock and there is also a demand for that. I would love to buy some Japanese maples from your friends at the backyard nursery. What is the best way to get in touch with these people and buy a few for our yard? My timing has been off when the window opens up to be a member so until then will you give me a contact? Thanks Mike and I appreciate your words of encouragement throughout the season. Thanks for all the beautiful fall foliage pictures, Mike! I would love to start growing some of them next spring. We recently had to place my mom in a nursing home for rehab from a hip surgery, and they have the most spectacular Japanese Maple in the courtyard there. I don’t know what variety it is, but it is just brilliant red! Puts all the other drab/gone-by plants and trees to shame, and really lifts one’s spirits. And, I don’t know why the burning bush would be on anyone’s list of invasive plants, either. I just love them. I have two outside my condo, but would like to propagate them and make lots more! Try asking if you can pick seeds from the tree and then plant them yourself, either in a nice, prepared bed in fall, or in early spring after the seeds have been left out in the cold (or put in the fridge) in a paper bag; Right now I have seeds from a beautiful red Japanese maple, and an even prettier purple one that I gathered on hands and knees after they fell in late October/early November. Hey mike do you have any videos or explinations for fruit bearing tree pruning? Mike..I see your Japanese Maples ‘covered in Snow’.. I have gotten them to sprout from seed in pots buried in the garden the previous Fall.. but do not have enough courage to try them outdoors all season in Zone 3B..should I try in a sheltered location with one of them, and see how it does ? May have to ‘fence it in and cover with leaves’..just my area can hit -50deg..yet 3 days later, can be +50deg with strong ‘Chinook Winds’ ! Very tough on any plants with those extremes ! I have seen Trees Bud in February here..only to get -40deg a few days later ! Most of my shrubs, ‘Eunoymus Alatus Compacta’ and ‘Sambucus nigra Black Beauty’ suffer from frost damage many years..have to be cut way back..but come back very well in the late summer ! Here is an example of ‘this weeks weather’ variables we experience here ! 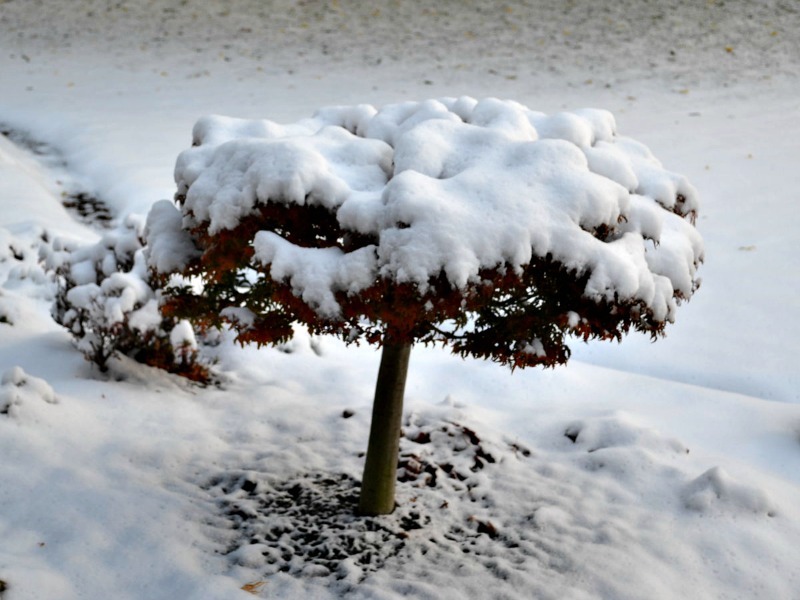 Even here Japanese maples can suffer winter damage. Most years they don’t, but I’ve seen years when it’s gotten down to zero and stayed there for days at a time and when that happens, many plants, not just Japanese maples are affected. However, the last time I saw that happen many mature Japanese maples were damaged, but all of the smaller ones that I had planted in landscapes the previous season did just fine. The cold bothered the more mature plants than it did the really young plants. On the mature plants the cold literally blew the bark right off the trees and either killed them or seriously damaged them. Why don’t you folks list the zones for plants you promote? Frustrating as a zone 3 person. I never think to include zone info and in many cases I’d have to research each plant to know for sure. If you see me growing and sharing plants that I am growing they are perfectly happy in zone 5, many in zone 4. Zone 3 is more challenging. Most Japanese maples are rated as zone 5. Hi Mike were do you get your nursery pots from? Tyler we have a number of different wholesale suppliers that we use. My system comes with a wholesale directory which lists all of the suppliers that we use and our members actually get a discount with at least one of them. Hi where do you get your pots? Do you do any kinds of maples? I have dozens of different kinds of Japanese maples. I don’t ship any at this time, but our members have access to some incredible wholesale buys as low as $7.00 each for rare Japanese maples. I love this site and have seen every one of the videos but I’ve never gardened in my life. I don’t even mow the lawn, which is actually just a bunch of weeds that look sort of like a lawn when they’re mowed – the kids come over and do that for me. As far as I’m concerned there are no stupid questions. There are a lot of things in life that I don’t know that seem like basic information to others with more experience. Gardening is the same way. If you don’t know ask, that’s why we are here. 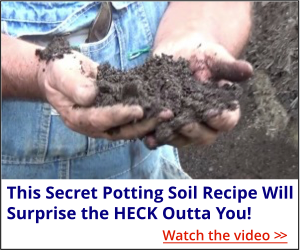 I have touched on planting potted plants but probably included in a video with something else. I do need to do a stand alone video on the subject.